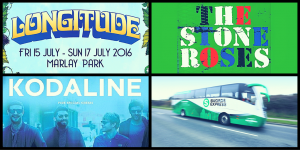 Swords Express will operate special coach services between Swords and Marlay Park for the Kodaline, Stone Roses and Longitude gigs taking place on Friday, 8th July, Saturday, 9th July, Friday 15th July, Saturday, 16th July and Sunday, 17th July. Tickets are €20 daily return or €45 for a 3-day Longitude travel pass. Tickets are available via pre-pay ONLY and must be purchased online via our secure Eventbrite page.